Hello!! 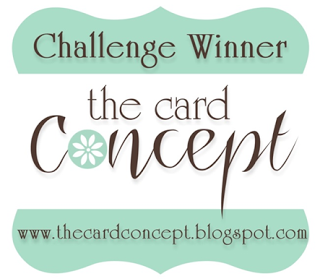 Popping in with a card for the September Reverse Confetti Sketch For You To Try that closes shortly. I always try to play along and I kept thinking all month that I had plenty of time and then... YIKES!!! 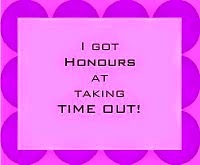 I only had a few days left!! I paired it up with the current Merry Monday Christmas challenge. 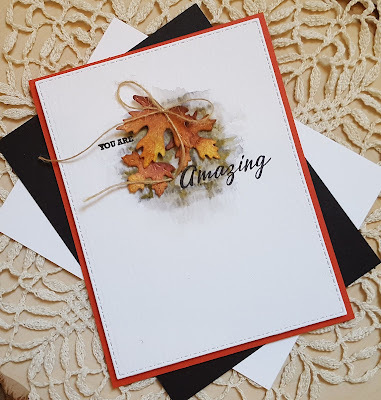 I used the Reverse Confetti Seasonal Sentiments stamp set, the Branch Out, Class Act, Tag Me and Mini Circle Garland Pretty Panel Confetti Cuts for my card. The Merry Monday Christmas challenge is to use light pink, dark pink and silver or grey. 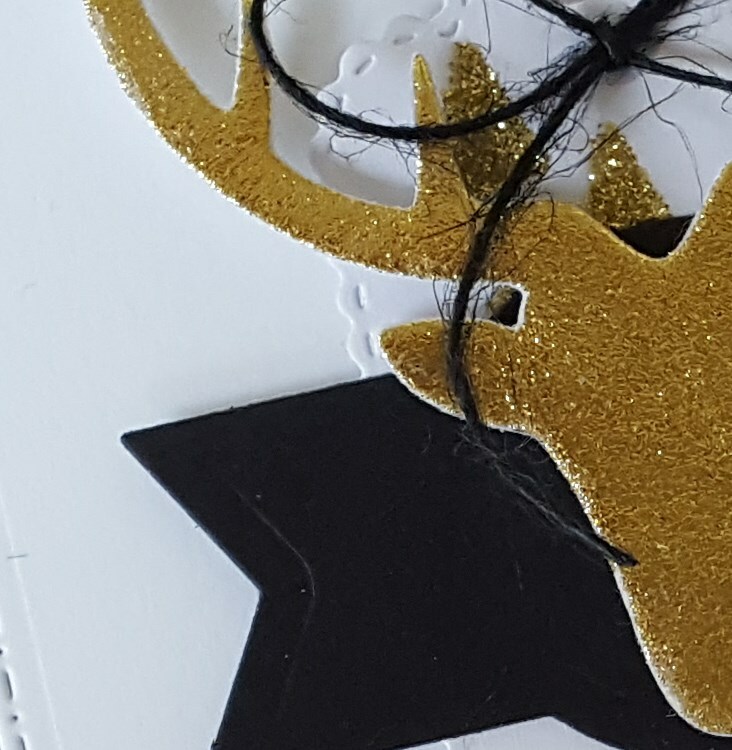 I used both silver and grey for my card. I die cut the Mini Circle Garland Pretty Panel from silver glitter cardstock and then adhered it to some light pink gingham patterned paper that was die cut using the Class Act panel die. To give the panel a bit more stability I adhered a second panel that was die cut from some pink cardstock. 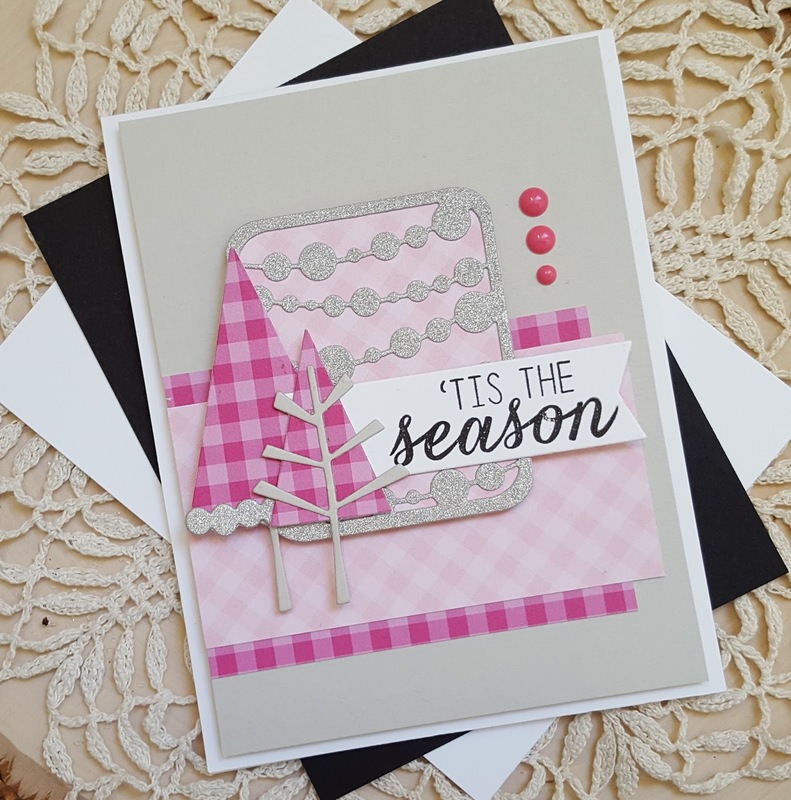 The trees were die cut from dark pink gingham patterned paper and the tree trunks from light grey. 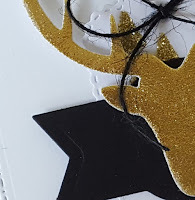 The little scalloped piece that was adhered to the larger tree from silver glitter cardstock, as well. 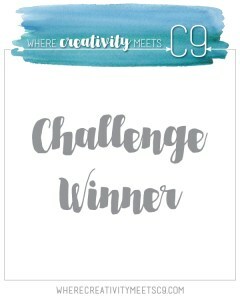 The sentiment was stamped on a banner die cut using the Tag Me Confetti Cut die set. 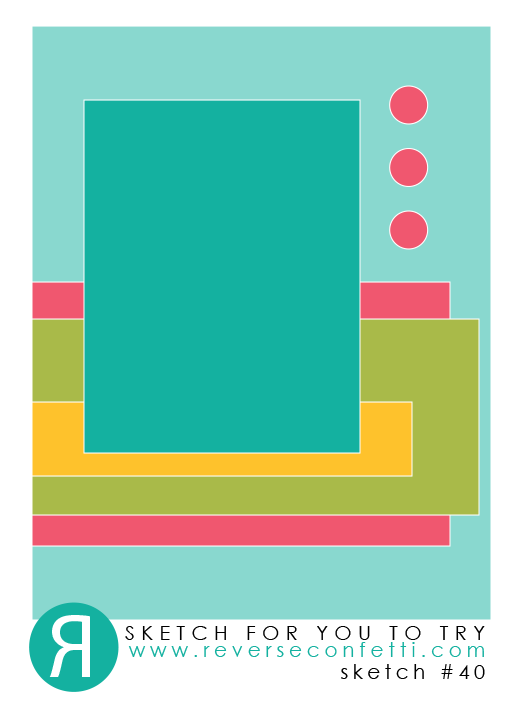 I cut additional pieces of the patterned papers per the SFYTT layout and then layered up everything. I finished by adding the dark pink enamel dots. I'm also going to add this to the current Simon Says Stamp Wednesday challenge of anything goes. 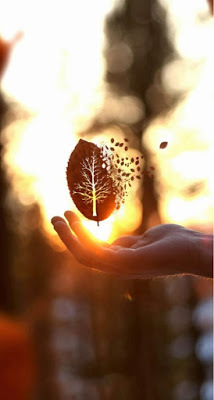 Hope you have a wonderful day... please head over to the AJVD blog for a look and to let me know what you think. Hello!! 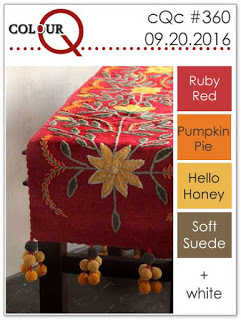 Can't believe September is almost over and that it is time for PTI's monthly blog hop. This month Nichole provided a clean and simple photo as inspiration for our projects. When I saw the photo I knew immediately that I was going to use my Rustic Wreath stamps and the matching die. I was finally able to get Rustic Wreath earlier this year. It was so popular that every time I went to purchase it I couldn't because it was sold out!! I started out by die cutting the wreath from kraft and green cardstock. 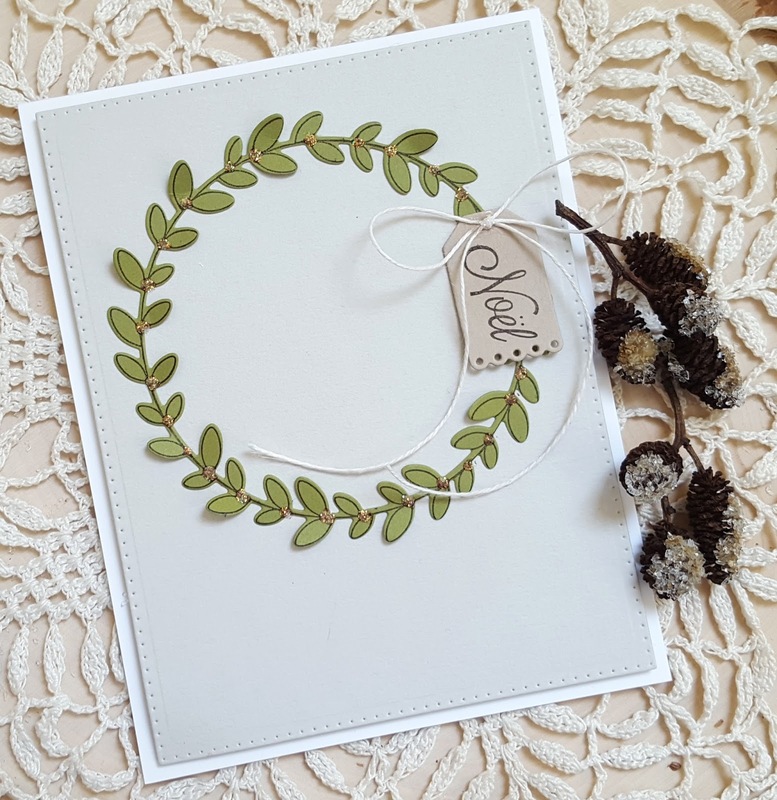 I then stamped the wreaths with the matching wreath stamp. Once that was done I matched them up with my light grey cardstock to see which I liked better. In the end I decided to go with the green wreath. I used a tiny kraft tag that was die cut using the Tiny Tags die, masked off the Joyeux in the Joyeux Noel sentiment, inked up the noel with the same espresso ink I used to stamp the wreath and then stamped it on the tag. The wreath was adhered to my light grey cardstock panel and then I added the tag and a simple bow tied from off white hemp twine. I added a bit of sparkle with some Diamond Stickles. Clean and simple and I absolutely love it!! Hello!! Yes... fall is officially here and with our weather being so lovely making fall inspired cards is not hard to do!! As some of you might know my sweet friend Lisa and I have been doing a little personal challenge involving CASology. I didn't participate last week because I just couldn't come up with a good idea for their cue word, but this week was totally different. When I saw the cue word I immediately hit upon an idea and thankfully it worked!! I don't know about you, but I have had a ton of "great" ideas that do not turn out great, lol!! I will be posting this to ColourQ as I used that color palette (it is very fall inspired) and since I used Simon Says Stamp products for my card I will be adding it to this to the SSS flickr challenge. As my starting point I die cut a frame from Ruby Red cardstock using two Spellbinders plain square dies. I then stamped the leaves from the SSS set Apple of My Pie using the Hello Honey and Pumpkin Pie inks. 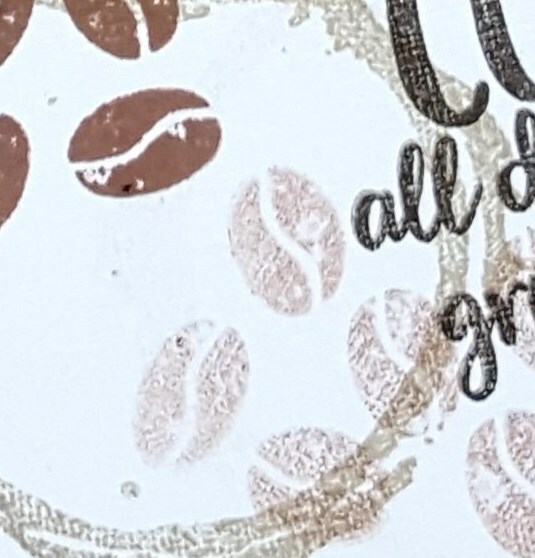 The outline leaf was stamped using Hero Arts Latte ink. The glasses from the SSS set I See You were also stamped in the Latte ink and then die cut with the matching die. 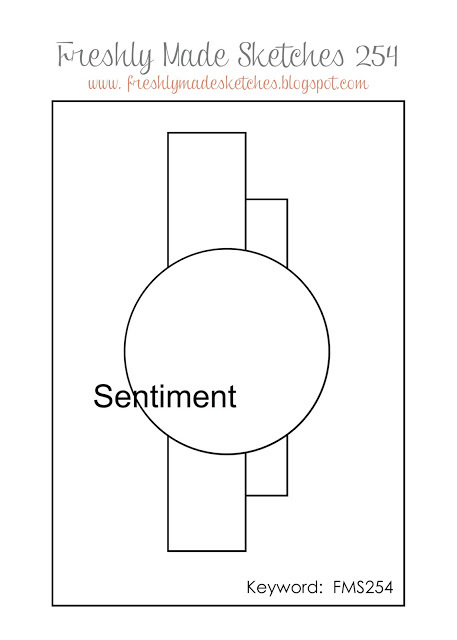 The sentiment (also from I See You) was stamped in the lens. 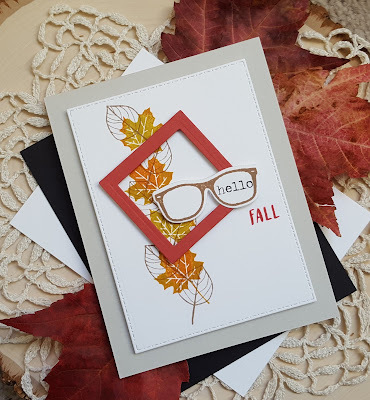 I die cut the panel with the leaves stamped on it and then added the frame and the glasses. 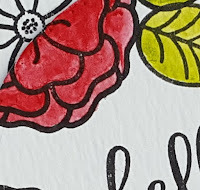 I finished up by adding the sentiment "fall" (from a Hero Arts set) using Ruby Red ink. So... I have some "frames" (glasses) within a frame! 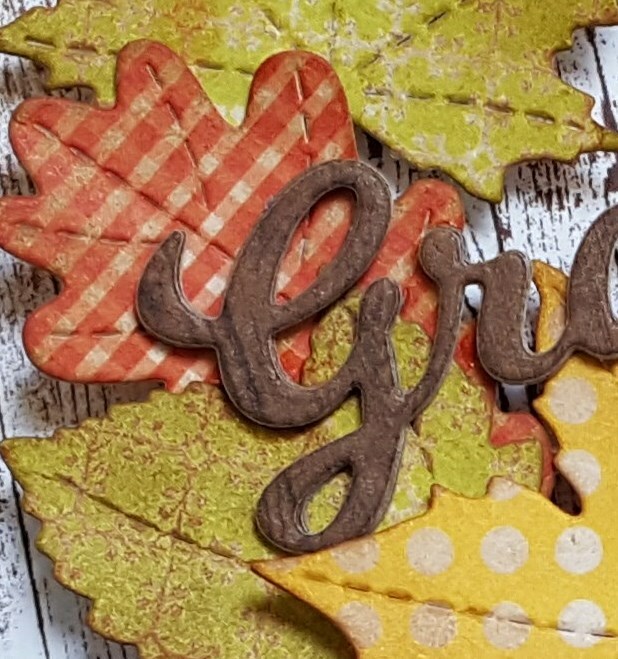 Hope you have a wonderful... please let me know what you think and make sure that you head over to Lisa's blog for a look at her project... I know it is super clever! Hello!! Popping in with my card for the current Essentials by Ellen Pin-Sights challenge, as well as the current Freshly Made Sketches challenge. 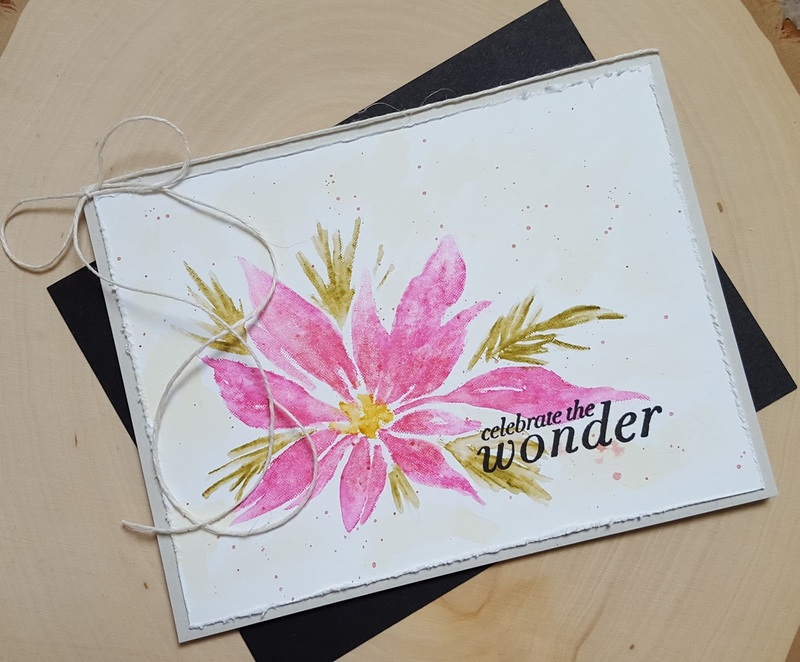 Last week Ellen Hutson had a sale on all stamps on the website so I took advantage of the sale and purchased the Essentials by Ellen Mondo Peony. I don't live too far from where Ellen Hutson is located and since they give you the option of picking up locally I decided that I would use that option. So Monday morning I head up north to Issaquah, Washington and saw the place where everything happens at Ellen Hutson! And the other day I got the chance to use one of those gorgeous peony images from Mondo Peony! I stamped it in VersaFine Smoky Gray and then colored it with a light blue ZIG clean color marker. 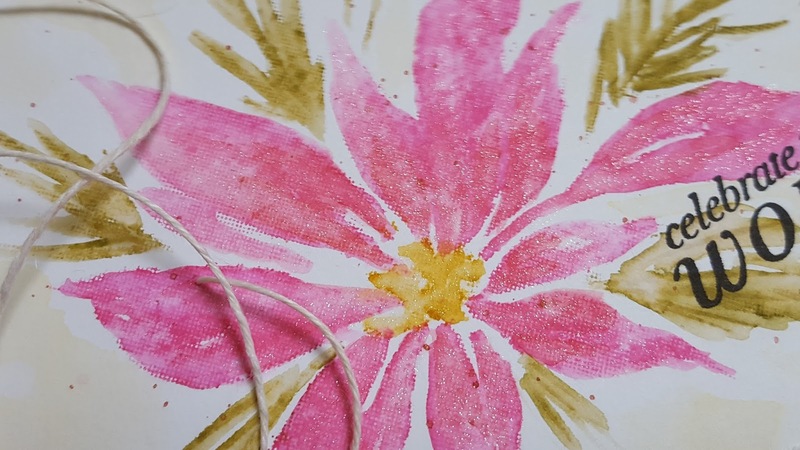 I added a shadow around the bottom of the flower using ZIG markers in two shades of gray. Once the image was completely dry I trimmed it down and adhered it to my card base. 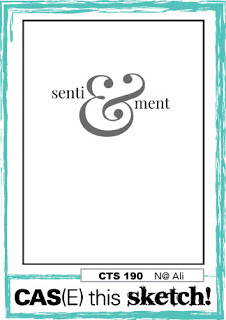 The sentiment (from the Essentials by Ellen Lovely stamp set) was stamped on a strip of white cardstock and then some silver glitter cardstock was added. I added a few loops of silver thread to the panel and adhered it down with the sentiment strip. Simple, but I love how it turned out! Have a wonderful day! I hope you will take the time to head over to the AJVD blog for a look and to let me know what you think. Hello!! Well the weekend has rolled around once again! Can't believe that September is half over already... time sure does fly by doesn't it?? 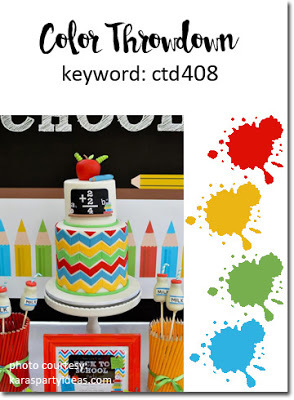 While the boys were at school and my hubby was working hard to finish up the boys' bathroom I decided to make a card for a few different challenges. I love the inspiration photo over at Time Out and when I saw that the new SSS flickr challenge was to use fall colors I knew what I wanted to do. 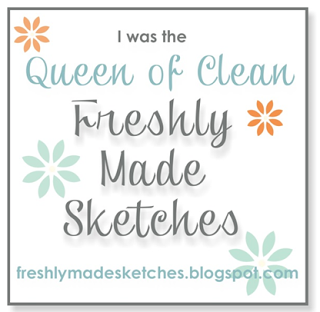 The layout is based on the current CAS(E) this Sketch so I will be posting it there, as well as at the SSS Wednesday challenge of clean and simple. 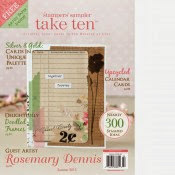 Last year I purchased a trio of small leaf dies from Simon Says Stamp and had never used them. I pulled them out and die cut three from white cardstock. I then inked them up with some Hero Arts inks in rust, mustard and deep burgundy. Once I had that done I set out figuring out what kind of background (if any) I was going to use. An old brick gate/wall figures prominently in the Time Out inspiration photo and so I decided I wanted to create a little brick wall background. Question was... how would I do that? I hunted through my stamps and finally found a SSS set that had a small rectangular image that I could use as a brick. I actually flipped the stamp over and used the backside. I stamped my "bricks" using a grey Tombow marker on to watercolor paper. Once I had them stamped I added some additional grey the the "bricks" with the same marker and then blended the ink out with water. An olive green color was added with another marker and blended out to give it a more aged look. Once I had it to my liking I let it dry. The leaves were position approximately where I wanted them and then I placed the sentiment (from the SSS set Sketch Ranunculus) where I wanted it on the panel, picked it up with my MISTI and then stamped it in black ink. The leaves were then adhered and a little twine bow was added to the top leaf. I realize that you really can't see my "brick" work, but I think it adds a nice depth to the card and it was fun to do!! Going to add this to the current City Crafter challenge of turning a new leaf. Hello!! Haven't been in the mood to do much crafting lately so the other day I just decided to make something and see if that would kick my creative funk out the door! It worked... sort of, lol!! 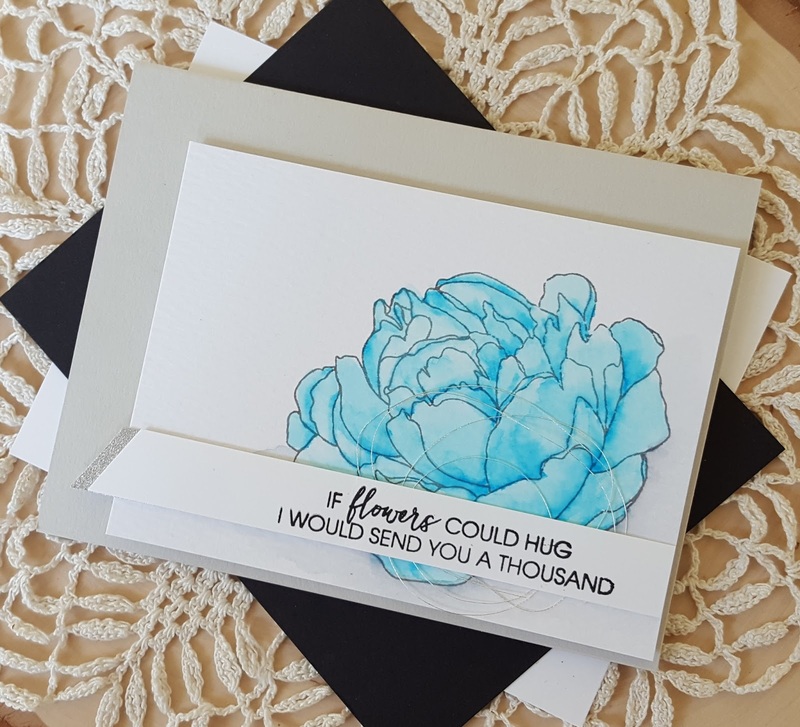 I did get two cards made and I'm sharing one of them today. 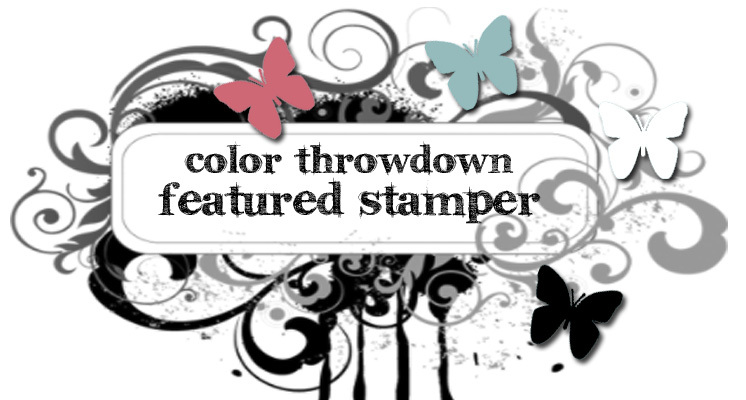 This is for the new Color Throwdown, Freshly Made Sketches and Simon Says Stamp Wednesday challenges. 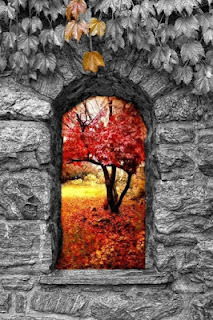 Fall is in the air I cannot wait to get me some pumpkins!! I absolutely love pumpkins!!! In the meantime I created a card with a pumpkin on it! Last year I purchased the Reverse Confetti Pumpkin Patch stamp set and the matching dies after pumpkin season had passed so this is the first time I have actually used these stamps and dies. I inked up the pumpkin with some Hero Arts Soft Cantaloupe, the leaves in SU! 's Coastal Cabana and the stem and curlicues in SU! 's Smoky Slate. Everything was die cut with the matching dies and then I got to layering up my elements. A couple of strips of patterned paper from an older Webster's Pages line called Family Traditions were cut and adhered on my white panel. I put together my pumpkin and adhered it with foam dimensionals. The panel was adhered to a light grey cardstock base and I was done. Clean and simple pumpkin perfection, lol!!! 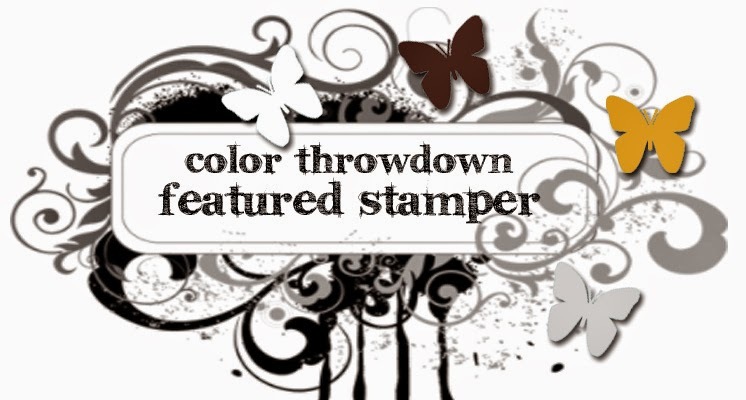 Supplies: Cardstock: SSS fog, white; Patterned paper: Webster's Pages; Stamps: Reverse Confetti; Dies: Reverse Confetti and A Jillian Vance Design; Inks: Hero Arts and Stampin Up! I really appreciate those of you who take the time to head over to the AJVD blog to not only to have a look at my project, but to also take the time to leave me a comment. Hey friends!! Popping in with a card that I made for the current CASology challenge. 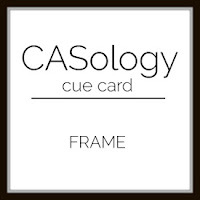 Lisa and I have been enjoying our little challenge involving CASology so we keeping it going! 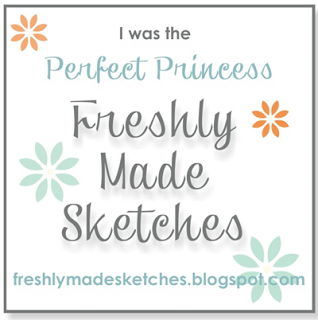 I like Jennifer's sketch so much I used it, again, for my card so I'm going to add this to the current Freshly Made Sketches challenge and the Simon Says Stamp Wednesday challenge of stamp it. Not a lot of stamping on my card... but my sentiment is stamped! Took me three time to finally come up with something that worked for the CASology cue word of beach. I have only one stamp set that would work for a beach inspired card, but nothing I tried using that set worked. So I went fell back on the other beach themed item I have... my Reverse Confetti sand dollar die. I watercolored some Ranger watercolor paper with ZIG markers in two shades of grey and then die cut the sand dollar and the "star". 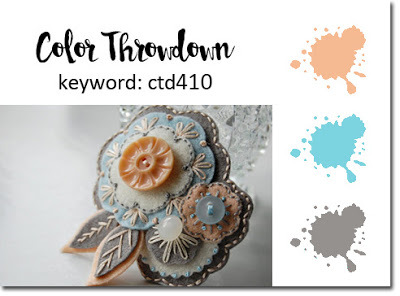 Another piece of watercolor cardstock was colored with light blue and light brown ZIG markers to look like the beach and the ocean and once it was dry die cut with the largest tag from the RC Tag Me die set. 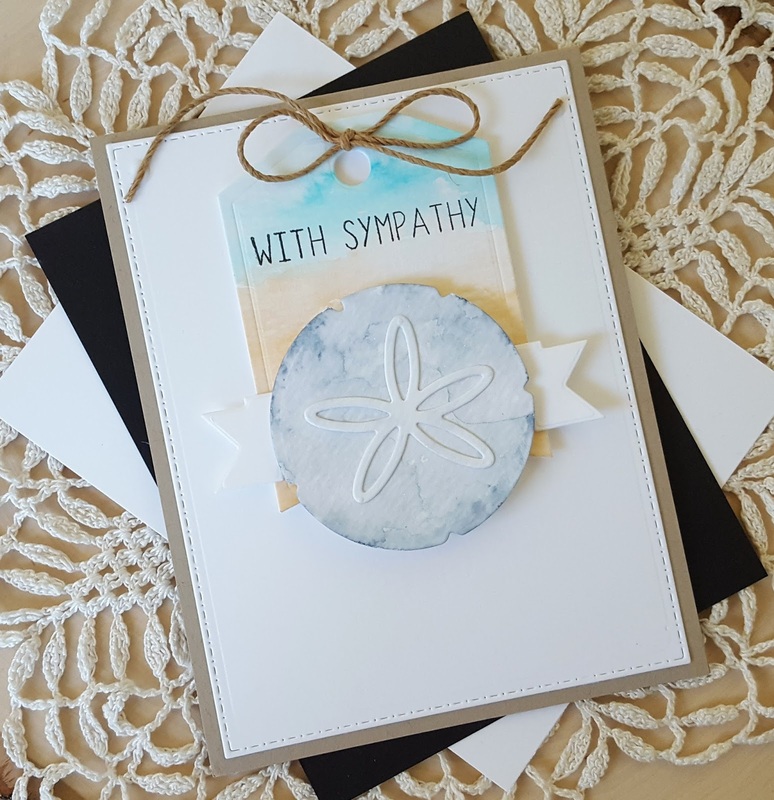 The banner layered behind the sand dollar is also an RC die. 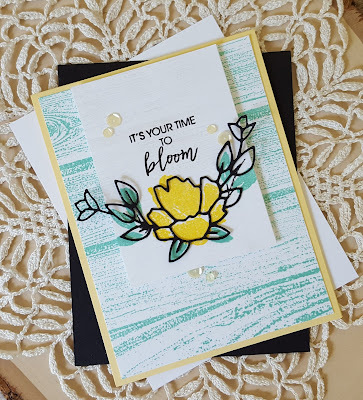 The sentiment is from the RC Petals 'n Posies stamp set and was stamped in black ink. I layered everything up on a white cardstock panel and then mounted it on a kraft cardstock base. 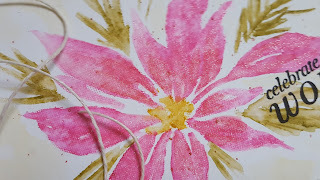 Hope you have a wonderful day... please stop by Lisa's blog to see what she came up with. I know it is something clever!! Hey friends!! 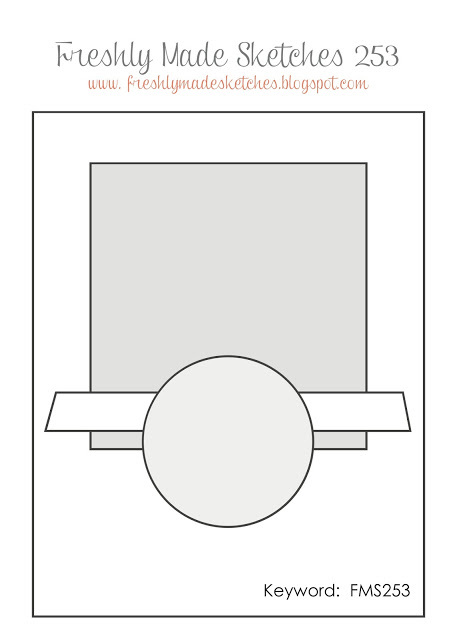 Popping with a card that I made for several challenges. The current Essentials by Ellen Mix It Up challenge is asking us to mix our Essentials by Ellen products with products from Concord & 9th. I recently got some happy mail in the form of a new EE stamp set (from the late summer release) and several stamp sets and dies from Concord & 9th. I combined the Mix It Up challenge with the current Color Throwdown and Freshly Made Sketches challenges. 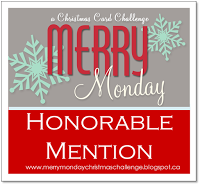 Since the Simon Says Stamp Monday and Wednesday challenges are "stamp it" I will also be adding my card to those line ups. I cut a piece of white cardstock and then stamped it with the Barnwood Background using light grey ink. 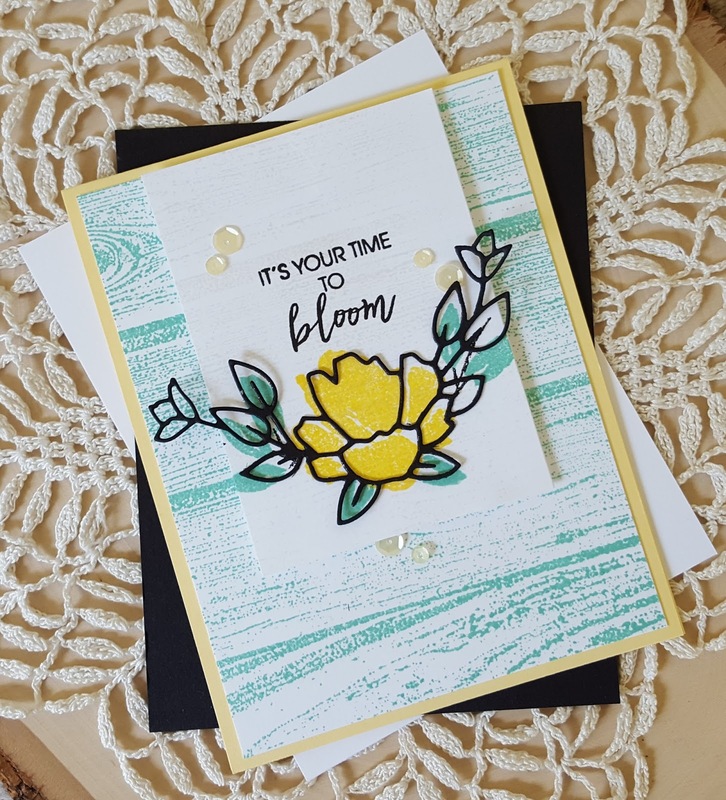 The large blossom from the Brushed Blossom stamp set was stamped using yellow ink and then the leaves were added using aqua ink. 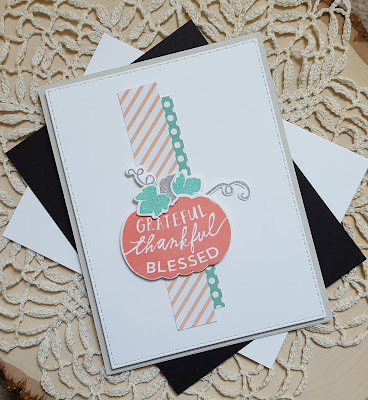 I then overlaid the die cut on top and stamped the sentiment from the Essentials by Ellen Lovely set in black ink. The Barnwood Background was stamped again using the same aqua ink and trimmed to fit my yellow card base. I finished things off by adding some pale yellow Pretty Pink Posh sequins. 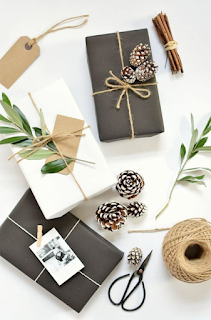 Hope you have a wonderful day and that you will take the time to head over to the AJVD blog for a look and to let me know what you think! Hey friends!! Well... summer is winding down and I'm trying to get back to crafting so I decided to play along with CASology. This week the cue word is "stitch" and I had a few ideas as to what I wanted to do. I have some stitching dies from PTI and I knew that I wanted to use actual stitching on my card. I used four of the dies from the PTI Stitching Lines dies to create my stitching lines. 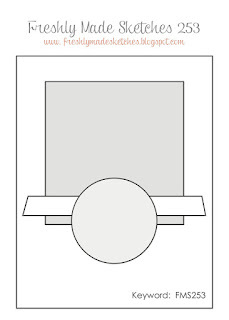 The panel was then die cut with an AJVD Stitched Dot rectangle die. 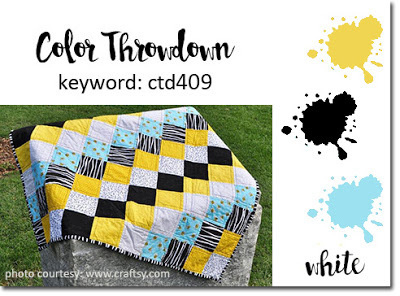 I used the colors from the current Color Throwdown challenge of yellow, blue, red and green. I pulled out my huge collection of embroidery floss and found floss to match the Color Throwdown combo. As I stitched each line I left a tail at the top and the bottom for s little added interest. The sentiment is from the AJVD Quilt Quotes. I die cut the smallest rectangle from the Stitched Dot rectangle die set and then stamped it with the sentiment. Copic markers in the same colors were used to color in the word "stitches". I adhered the sentiment to my panel and then everything to a light grey cardstock base and I was done. Very clean and very simple!! 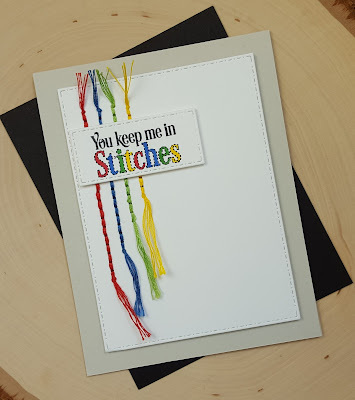 I'm also adding this to the current Simon Says Stamp Monday challenge to use stitching (real or faux) and to the current Simon Says Stamp Wednesday challenge of anything goes. 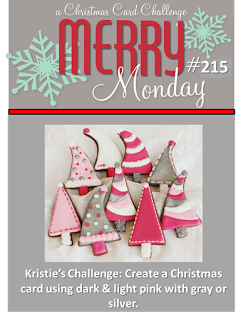 Hope you have a wonderful day... Lisa and I are both participating in the CASology challenge so please check out what she created here! Hey!! Hope everyone in the US is enjoying the long weekend. School starts for my boys on the 7th. They aren't super excited, but I know they will be back in "school routine" in no time!! 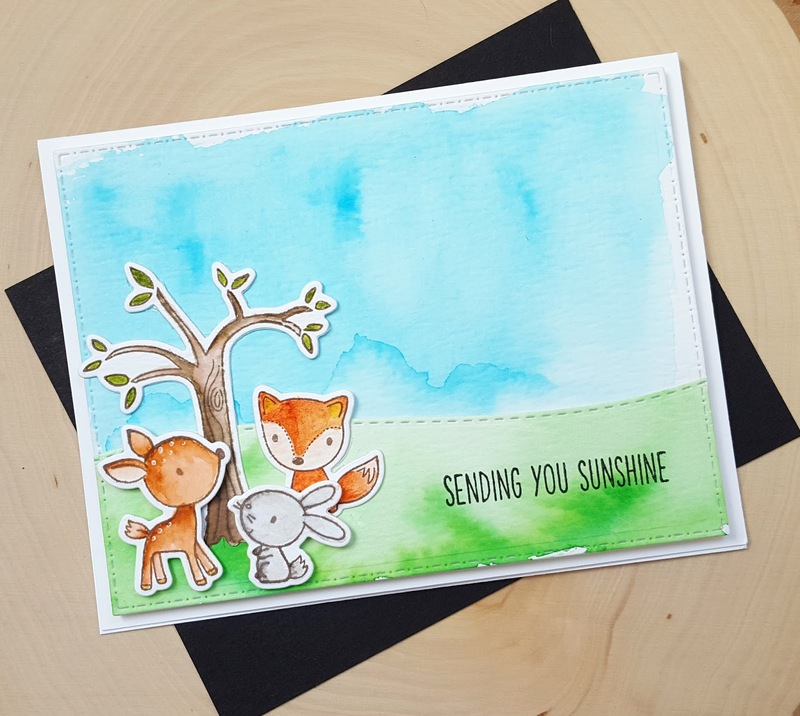 Found some time on Friday afternoon to create a couple of cards and I'm sharing one today. I used the current Freshly Made Sketches layout so I will be posting it there, as well as to the current Time Out challenge to be inspired by the following quote: "Love the trees until their leaves fall off, then encourage them to try again next year". Now... my tree doesn't have a lot of leaves so I guess I have been loving them until they fell off, lol!! I'm also adding this to the current Simon Says Stamp Wednesday challenge of anything goes. I pulled out my MFT Sweet Forest Friends stamps and dies to create my little scene. I used my ZIG markers to color up all the little images before die cutting them with the matching dies. The sky and grass were also colored with ZIGs, left to dry and then die cut with AJVD Stitched Dot rectangles. The green panel was then die cut down further with one of the dies from the AJVD Slippery Slopes and Stitched Clouds die set. I stamped that piece with the sentiment and then layered everything up per the sketch. Simple, but sweet I think!